What’s it like to be a real-life, world-class scientist? Year 9 school students from in and around Plymouth had a taste of finding out at a visit to the Plymouth University Peninsula Schools of Medicine and Dentistry (PUPSMD). 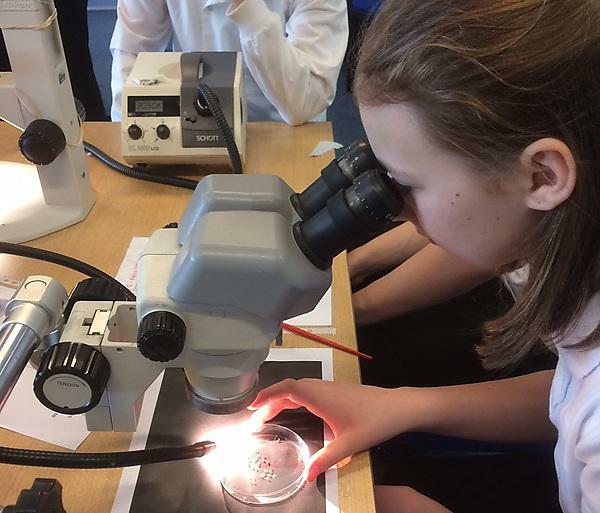 The pupils took part in experiments at the campus in Plymouth Science Park, extracting DNA, learning about how to grow cells, and exploring how the fruit fly can be used to model and understand human disease. Organised by Professor David Parkinson and his colleagues at PUPSMD, the tour also included a visit to the University’s Brain Tumour Research Centre of Excellence. In all, more than 150 pupils took part from Heles School; Coombe Dean; St Boniface’s Catholic College; Devonport High School for Girls; Plymouth High School for Girls; Ivybridge Community College; Plymouth School of Creative Arts; Mount Tamar; All Saint’s Academy, Plymouth; Tavistock College; Pool Academy, Redruth; and Launceston College. Some of the research the students saw will soon be based in the University’s Derriford Research Facility – which is due to be opened by HRH The Princess Royal in May.